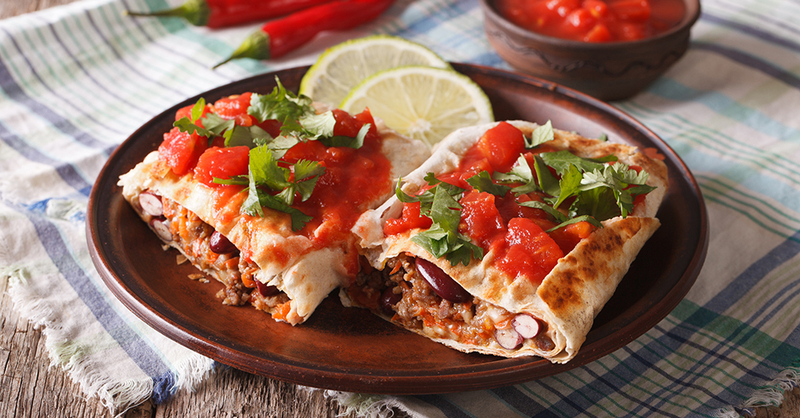 We’ve always loved beef chimichangas from our favorite Mexican restaurant, but the thought of making them at home used to seem a little daunting. But after a little tinkering in the kitchen, we’ve got a real winner on our hands: a hearty Mexican dish the whole family loves! We find securing the tortilla around the filling with a toothpick until the chimichanga is fried is the easiest way to keep them together during the process. While we still plan on going out from time to time, now we can have one of our favorite meals more often — and without breaking the bank! Add the ground beef and chopped onion to a frying pan over medium heat. Use a spatula to chop the beef into small pieces as it browns. Drain the beef and add the black beans, cheddar cheese and enchilada sauce to the pan. Mix the filling to combine. Spoon one-sixth of the filling into a tortilla. Fold one side over the filling, then fold both ends inward. Roll the tortilla so the filling is enclosed, and secure the end in place with a toothpick. Repeat with remaining tortillas and filling. Add the oil to a deep frying pan to a 1-inch depth, and heat to 375º F.
Place two prepared chimichangas in the pan gently to avoid splashing the hot oil. Fry for two minutes per side, remove from the oil, and place on a paper towel-lined plate to drain. Repeat until all are cooked. Garnish with salsa, fresh cilantro and lime slices. Serve immediately and enjoy!